ANC Preview: Will Apple Show Up? To start off, Jack Evans will be there to address the community for some reason. OK, not that exciting but that’s just the undercard for night. A few quick items, and then, BAM, gun stores in Georgetown! It’ll probably just be a chance for the ANC to sound off about how dismayed they are about the fact that gun stores could theoretically open in Georgetown, but it should lead to some primo bloviating. After a bit of an intermission, the big show starts. 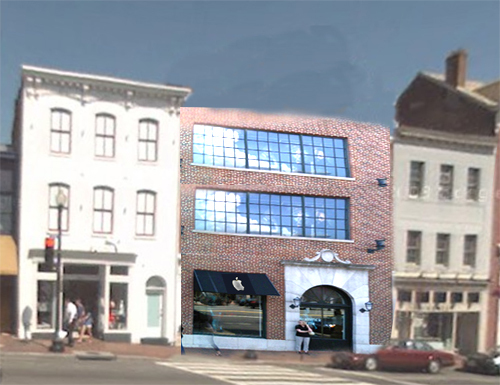 Quick background: the townhouse right next to Georgetown Cupcakery was recently turned from a private residence into a late night pizza joint. Philly Pizza & Grill (not to be confused with Philadelphia Pizza Company on 34th st.) ignored just about every single rule in the zoning and ANC book in the process of opening. The neighbors are extremely pissed about the noise, smell, parking, and trash from their new neighbor. The restaurant owners came to the January ANC meeting to ask for approval for a change to their ventilation system, which is like going to ask your mom if it’s ok to borrow the car after you took it the night before without permission and drove it off a cliff. Expect some serious sparks the fly over this kerfuffle. And saving the best for last: Apple returns! After teasing us with a last minute back-out from January’s meeting, will Apple actually show up this time? 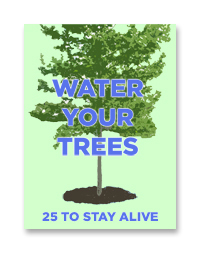 If they do, will they have gotten the message? GM will be there to purloin the designs and will share them with you poste haste. 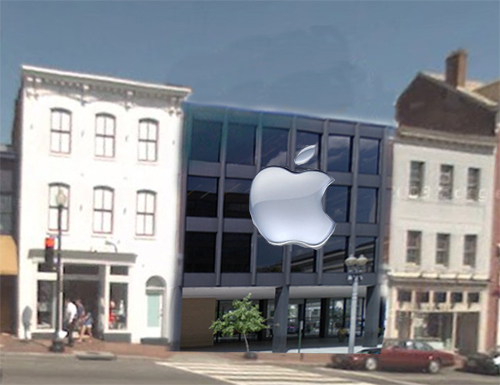 Did you cut out a piece of the DC library and paste a big Apple logo on it? I like your moxie.